Mortgage rates are a fickle beast affected by many factors. They can change on the drop of hat and fluctuate constantly. Your ultimate mortgage rate is determined by your overall risk as a borrower through a mechanism called loan level pricing (LLPA) which adds adjustments to your rate based on risk. Combine “base” rates – driven by actively traded pools of mortgages known as Mortgage-backed securities (MBS) – with your loan level pricing adjustments and you get your mortgage rate. If you have ever played the stock market you know that Wall Street can be erratic and irrational. Mortgage-backed security trading is no different. MBS pricing and trading responds to influences on the economy, including the Federal Reserve, the U.S. jobs market, as well as developments abroad (the Middle East, China, Europe, etc…). Since mortgage-backed securities are considered a “safe haven” investment by international investors, strife in the European Union, the Middle East – or wherever – often drives investors to seek investment safety in the waiting arms of MBS. This is sometimes referred to as a “flight-to-quality”. Since the price of mortgage-backed securities and your mortgage rate have an inverse relationship – they move in opposite directions – mortgage rates drop during “flight-to-safety” events. That is a large part of why you are still seeing such low mortgage rates now. According to Freddie Mac’s Primary Mortgage Market Survey (PMMS) rates remain near historical lows. 30-year fixed-rate mortgage (FRM) averaged 3.64 percent with an average 0.5 point for the week ending May 26, 2016, up from last week when it averaged 3.58 percent. A year ago at this time, the 30-year FRM averaged 3.84 percent. 15-year FRM this week averaged 2.89 percent with an average 0.5 point, up from last week when it averaged 2.81 percent. A year ago at this time, the 15-year FRM averaged 3.05 percent. Note that Freddie Mac’s weekly mortgage interest rate survey applies to conforming loans and conventional mortgage rates only. FHA, VA, Jumbo and USDA mortgage rates are not surveyed as part of the report. Rates for USDA, FHA and VA mortgage loans generally run slightly lower than rates for conventional mortgage loans while Jumbo rates are generally higher. You are probably wanting the meat and potatoes of this piece – where mortgage rates are headed for the rest of 2016 and beyond – right? There seems to be some disagreement among the most prestigious pundits on what’s next though. 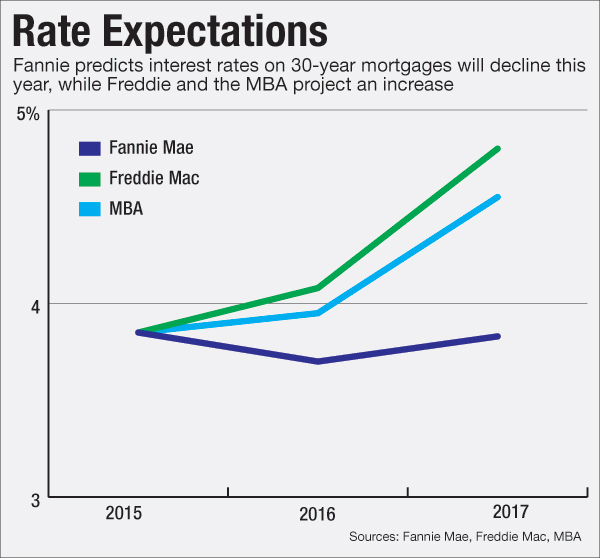 Fannie Mae Chief Economist Doug Duncan thinks the 30-year mortgage rate will remain steady and – by the end of 2016 – hover around 3.7%. Mike Fratantoni of the Mortgage Bankers Association an increase as well. His was smaller than that of Freddie Mac, but he believes nearly a .35 percent rise to 3.95% is likely. While the financial magazine Kiplinger predicted earlier in the year the 30-year fixed rate to end the year at 4.4% We can’t see that much of an increase, but in fairness it was earlier in the year when the prediction was made. That said, anything can happen in this market. So, what’s the takeaway? In my opinion rates will continue to hover around current levels to slightly higher until the Presidential Election in November. Once the election is over you’ll see rates jump. We’ve now had almost 6 years of mortgage rates below 5 percent – a complete anomaly from a historical perspective. The FED is probably going to hike the discount rate – the rate banks use when they borrow from each other – again this summer which generally increases mortgage rates too. That said, economic growth appears to be slowing down and – depending on the outcome of the election and level of turmoil abroad – we could avoid a hike and actually veer toward recession by end of 2017. If so, expect mortgage rates to continue to hover around 4 percent. The fact that mortgage rates are still hovering around historical lows should spur those that are risk averse to make their move and buy that new home or finally complete that refinance they’ve been putting off. If you are hoping for that tiny fraction of a percentage lower on your mortgage rate before acting you’ll likely end up disappointed. The old adage of “never look a gift horse in the mouth” rings true in many things and mortgage rates are no different. You’ve been given a gift that has lasted for much longer than ANY expected. Take advantage of it. Mortgage rates this low will not last forever.